ArtScapades presents 20th Century Art with lectures that can be used in a series, individually or customized to meet your needs. 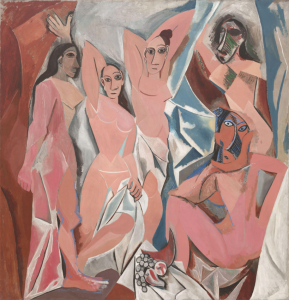 In Modern Beginnings, ArtScapades looks at the beginnings of Modern Art, covering in depth, the first two great Modern Masters, Matisse and Picasso. In European ‘isms’, ArtScapades shows the progression of Modern Art in Europe. In Modern American Beginnings, ArtScapades explores how a modern movement developed in America led by artists of The Ashcan School and The Eight. In The American Scene, ArtScapades details how artists included realism in their works, and looks at how FDR’s New Deal affected the art world. In Abstract Expressionism, ArtScapades looks at how artists filled their canvases with fields of color and abstract forms, or attacked their canvases with a vigorous gestural expressionism. In The Feminine Side of 20th Century Art ArtScapades looks at how women artists broke into the traditionally male dominated art world. In The Viennese Connection, ArtScapades explores the lives and works of four fascinating artists with Austrian affiliations. In More 20th Century Modern Art, ArtScapades looks at the lives and works of four more European Artists who brought unique styles to the Modern Art Scene. In The 20th Century Renaissance, ArtScapades delves into the lives and works of four American artists who depicted the African-American experience. In Pop!, ArtScapades looks at the artists who broke down the boundaries traditionally separating fine art and everyday life, and laid the foundation for the art world’s aesthetic embrace of commodity culture. In Modern American Beginnings, ArtScapades covers in depth, the first two great Modern Masters, Henri Matisse and Pablo Picasso. In European ‘isms’, ArtScapades looks at works by Edvard Munch, Wassily Kandinsky, Joan Miró, Salvador Dalí, and Marc Chagall. In Modern American Beginnings, ArtScapades explores George Bellows, Robert Henri, William Glackens, John Sloan, and Edward Hopper. In The American Scene, ArtScapades presents artists that include Thomas Hart Benton, Grant Wood, John Steuart Curry, and Andrew Wyeth. In Abstract Expressionism, ArtScapades looks at William de Kooning, Jackson Pollock, Clyfford Still, Mark Rothko, and Barnett Newman. In The Feminine Side of 20th Century Art ArtScapades chronicles the lives and works of Georgia O’Keefe, Frida Kahlo, Lee Krasner, Joan Mitchell, and Helen Frankenthaler. In The Viennese Connection, ArtScapades studies Gustav Klimt and his student Egon Schiele, Lucien Freud, grandson of the famous psychoanalyst, and his artistic rival, Francis Bacon. In More 20th Century Modern Art, ArtScapades analyzes Piet Mondrian, Paul Klee, Amadeo Modigliani, and René Magritte. In The 20th Century Renaissance, ArtScapades introduces Horace Pippin, William H. Johnson, Romare Bearden, and Jacob Lawrence. In Pop!, ArtScapades covers Robert Rauschenberg, Jasper Johns, Roy Lichtenstein, and Andy Warhol. Approximately fifteen works per artist are discussed including iconic works plus those that illustrate significant trends and events in their lives and careers.